The Chaotic forces based in the Goblin State of Porcia have been ravaging part of their Alpen neighbour. Theoretically also a Chaotic State, central control of Alpen collapsed long ago and every part tries to look after itself. 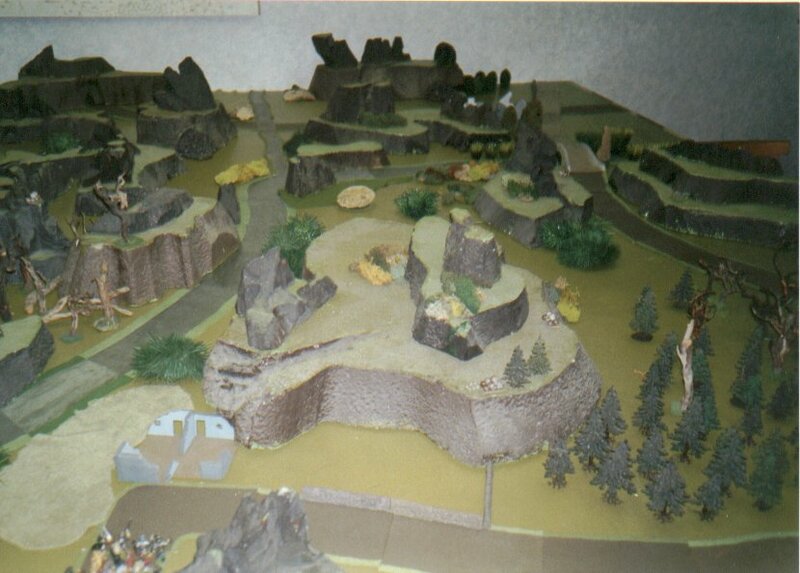 The Chaotic high Command has been complaining that units sent to reinforce the army in Narchad, have been harassed and even destroyed, passing through Alpen. Gagoley King of Belmain and Niseforrus Bigobb of Porcia, have used this as an excuse to attack Count Fair's wealthy territory. They have sacked the town of Stemmel, where a lot of loot and many prisoners were taken. The allies are now manoeuvring to engage Fair's army in the field. 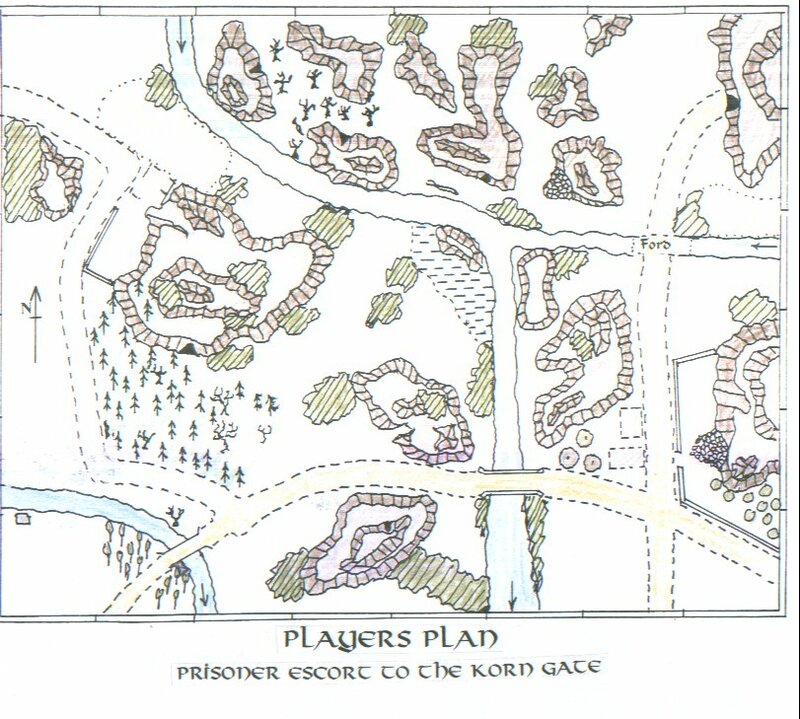 This action however, concerns the passage of a convoy of prisoners and loot, through the harsh borderlands to the safety of the Porcian Goblin cave network. It is designed for two players, (4 have been accommodated.) and a Games Master. 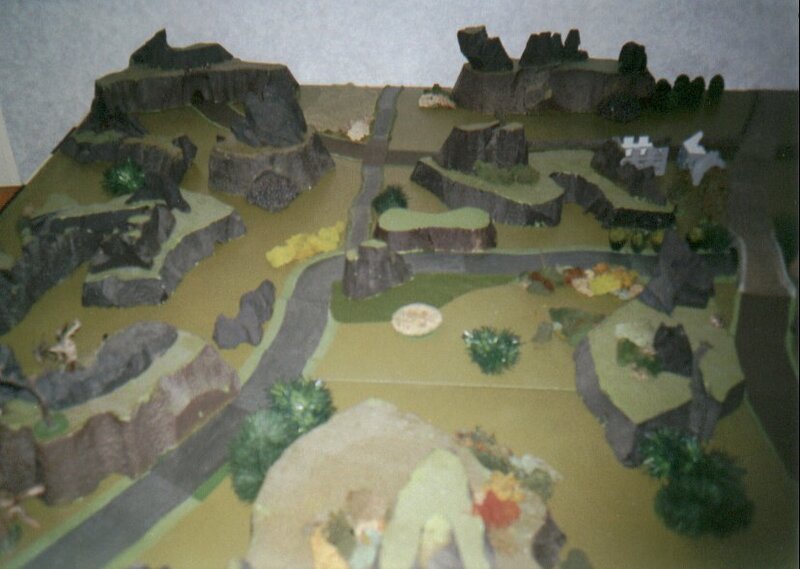 Click on the views below to see what the terrain looks like. 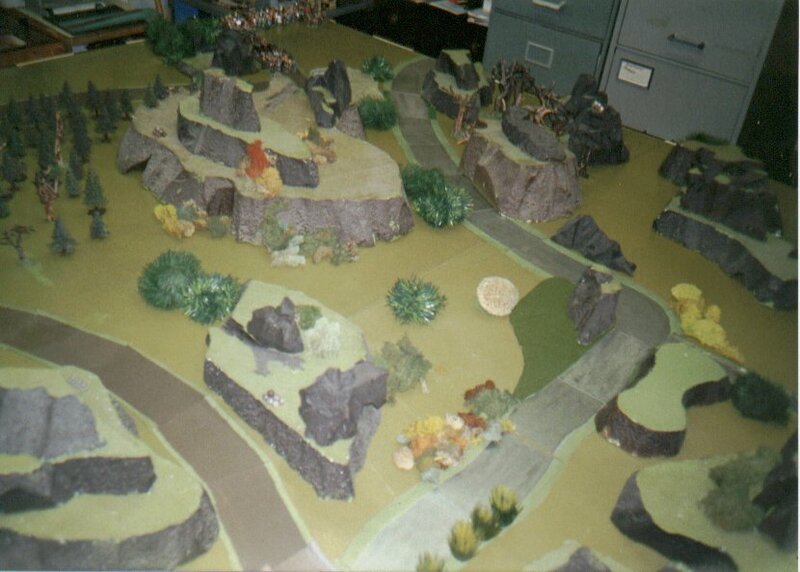 A general view of the north east corner of the table. The hills are made from thick polystyrene packaging cut with a hot knife. 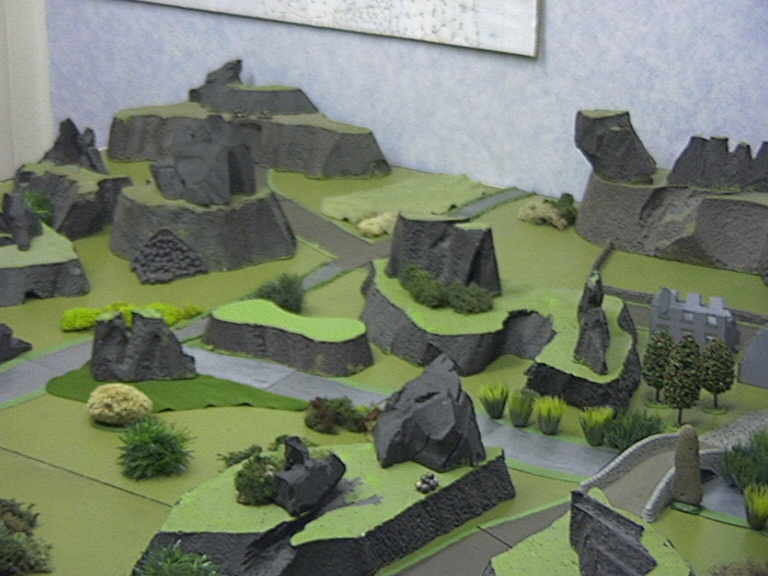 The rivers are made from card painted with aluminium or silver paint and edged with the same green used on the tabletop. They are painted on both sides. The Northern side of the table showing the river again. Also shown are the dead trees made from dried heather the spiky bushes from old Christmas decorations, clumps of bushes from lichen and a variety of bits picked up in sales. The Central part of the set up. The reed beds are made from a Christmas decoration and some aquarium plants. The roads are again painted card. The roads are painted brown on both sides and have green edges. Maybe if I was doing them again I'd make them brown on one side and grey on the other. 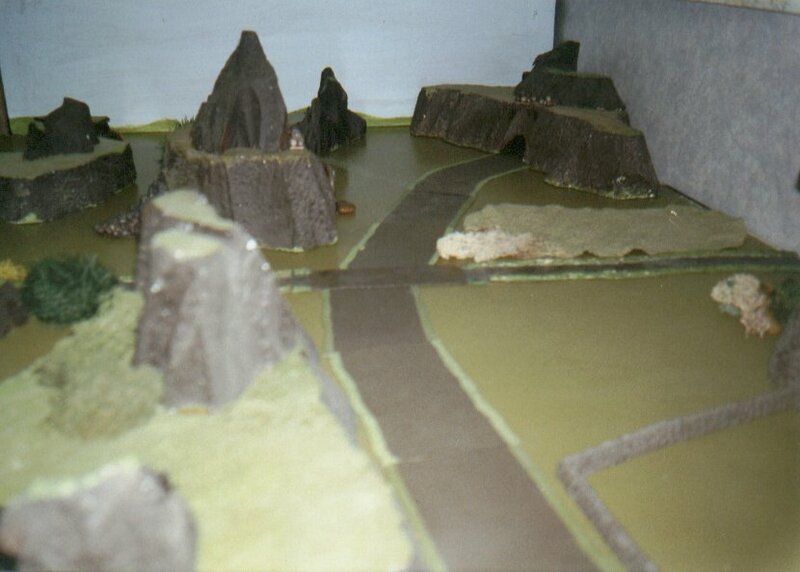 The entry point of the column showing a simple balsa ruin, some Faller (model railway) trees and heather roots. The destination. The ford is painted - road brown mixed into the silver "water". The field is a bit of green cloth anf the wall is an old Merit model railway item.